This weekend, the barn had a visit from Sharon Melnick, L.M.T. for people & horses. Although Sharon could easily hire herself out, she seldom works outside of her own critters. As a favor, she trekked from her remote patch of woods over to our remote patch. 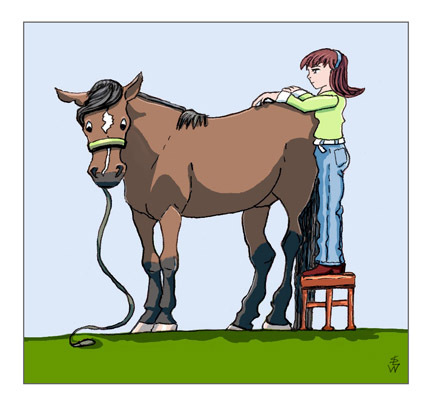 In addition to getting the the horses massaged, I hoped to improve my own technique. The horses noticed the difference immediately. Mathilda loved it. She chewed. She lowered her head. Her eye got soft. This from a mare who all but grits her teeth when I poke at her. When I took her out for a graze later, she was square and strong on her weak leg. Our only problem now is how to convince Sharon to come back out & go over her again. Rodney approved. You could see this from his eyes and the gyrations of his upper lip. However, he didn’t get into his usual yawn fest until 3/4 of the way thru. Mentally, he was balancing “I like” with “This is weird”. It takes a while for him to wrap his mind around a new idea. Sharon was properly aghast at his back scar. We had a moment of sympathy for the foal who was hurt so badly [Daddy Dearest]. I got at least as much out of it as the horses did. For example, I had gotten the wrong end of the stick for the “cross-fiber” maneuver. I was going back & forth over the muscle with thumbs in parallel, as one might move a tiny rolling pin ACROSS a counter top. The idea is to CRISS-CROSS the thumbs back & forth in each stroke, thereby spreading the muscle fibers. Watching Sharon was a reminder about good work habits such as posture and using bodyweight instead of arm strength. She used the stool occasionally but less than I do. Instead of standing over & bearing down, she used Rodney’s height differential to pull down. Much easier than getting up & down and constantly shifting a stool about. The most amazing part was that Sharon worked for an hour & 1/2 per horse without collapsing in a heap. After 20 minutes, my energy is gone. Sharon worked steadily, feeling her way through the muscles. I tend to hit it with a blast of perky enthusiasm & then burn out. Not a surprise. This is how I address all tasks, from writing an article to greeting visitors at the zoo [Serve]. I need to keep the good parts of what I already do, but slow down & find a sustainable way to massage more often. Metamessage: if you are learning, take classes. Once you have mastered a skill, take more classes. What was your most recent masterclass (formal or informal)?